Wildcat Travel Club bake sale was held Sat. with plenty of service and smiles despite the chilly weather. Pictured from left: Kim McFarland, parent; Michelle King, parent; Allie Decker, McKinley Satterfield; Cami Wulff; Chance Miller; Aubri Tillery; Emma Tabor; Marianna Sanchez; Gracie Elledge; all Wildcat Travel Club members, and Katrina Tillery, a parent who along with Kerri Sanchez (not pictured) will be accompanying the students on the 2021 WWII and Western Front Tour. The Wildcat Travel Club is actively raising funds for the Education First 2021 World War II and Western Front tour. 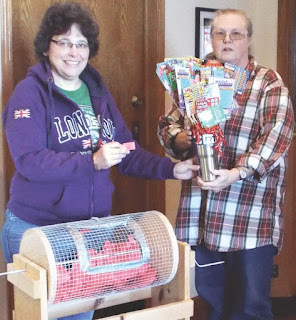 The young people sold raffle tickets for a Lottery Ticket Bouquet, which consisted of $50 worth of lottery tickets arranged in a 30-oz. RTIC insulated cup. 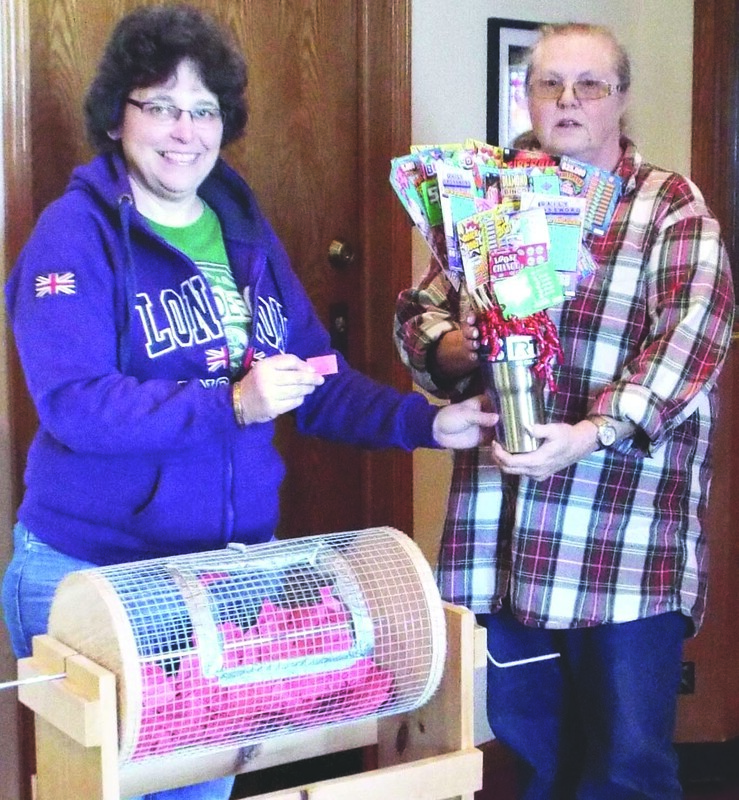 Sandy Miller won the Lottery Ticket bouquet at the drawing held Sat., March 16. Sandy Miller for the lottery ticket bouquet. The raffle sales contributed a total of $500 toward trip financing; each youth who sold raffle tickets will receive a credit to their individual monies account for the tickets they sold. Eight young people were signed up for the WWII tour as of November 2018. Sign ups will continue through Spring 2021. Suzanne Blackburn, who is organizing the 2021 historical tour, says the tour is also open to adults wishing to join them on this grand adventure. The Wildcat Travel Club will be holding numerous fundraisers throughout the next several months. In addition to the Lottery Bouquet Raffle, a bake sale was held on Mar. 23 at Town & Country Supermarket. A yard sale will be held on Fri. and Sat., April 5 and 6 at the rodeo grounds. Any donations of items for the sale will be greatly appreciated. The club will host a corn hole tournament at the Independence Day (July 4) celebration. Product sales from RADA Cutlery will also contribute towards the groups’ largest fundraising. These items are available at https://radafundraising.com, support the group by choosing Wildcat Travel Club. The club is also fundraising through Uncle Jerry’s T’s at https://www.unclejerrystees.com/credit_group_thankyou.cfm (Enter Organization Code 51752) The deadline for this fundraiser is April 5. There are plans to host a breakfast with Santa later in the year. The tour cost for young people under 20 is $5,015 and for adults $5,715. This includes a full-time director, five sightseeing tours led by expert, licensed local guides, eight tours with the 3-day extension and two walking tours led by the tour director. All details of the trip are covered including airfare, all other forms of travel while there, hotels, European breakfast and dinner daily. Tips and other group miscellaneous expenses will be provided by the club ‘group’ fund. “The Education First tours allow the kids and adults to see the world, not just the tourist spots. It’s real world where you interact with people that live and work at the locations visited,” says Suzie Blackburn. Among the many sites this World War II and Western Front tour will include are a Jack the Ripper tour held almost upon arrival; a tour of the Eiffel Tower; a ride on the London Eye, a cantilevered observation wheel on the South Bank of the River Thames in London; tours of the Imperial War Museum; Cabinet War rooms; Rouen Cathedral; Notre-Dame Cathedral; Ardennes American Cemetery and Memorial; Utah Beach Museum; Cologne Cathedral; Topography of Terror Museum and the Caen Memorial. The Wildcat Travel Club Tour will include a 3-day extension that includes the Nuremberg Documentation Center; Courtroom 600(where the Major War Criminals trials were held); Dachau and the Eagle’s Nest or Documentation Center. This is a truly unique experience that allows the participants to explore the world and allows the history from the textbooks to become more real and personal.